With winter coming at us, it’s time to grab the crockpot. With our busy schedule with 4h, Taekwondo, Bible Studies, homeschooling, homeschool activities, and homesteading, it’s nice to have a warm soup or stew going in the crockpot in the morning. It makes the rest of the day go by much easier. We love chilis, stews and soups and love having different combinations. 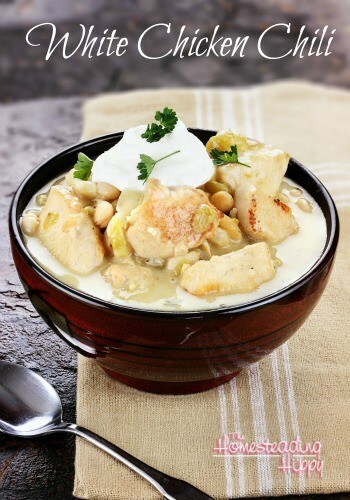 White chicken chili is a great alternative to the ground beef/red bean chili that we have. It uses chicken, nourishing bone broth, and great northern beans. The cumin and jalapeno give it a spicy twist! We love having this with tortilla chips and guacamole on the side as well. Hearty and creamy, this white chili is a perfect switch from red meat and bean chili! Begin by roasting your chicken breasts in a 400° oven for 20 minutes, or until cooked through, Remove and cool until able to handle. Cut the chicken breasts into bite size pieces and add to a crockpot. In a hot skillet, add oil. Add to the shredded chicken in the crockpot. Add the cumin, jalapeno, and chicken broth. Just before serving, stir in sour cream. Serve with dollop of sour cream and shredded cheese, if desired. I love chicken chili. I love to make it in large batches. I love this meal!!!! It’s been a long time since I’ve made it, but I think I need to give your recipe a try. Pinning this one! This looks wonderful. I’ll have to try this and see how the kids like it. This is something I’d love to make today. Chili is always a satisfying meal! We just had white chicken chili at a friend’s house recently and have been wanting to make it since. I’m pinning your recipe to try it next. Yum! I love White Chicken Chili! Can’t wait to try your recipe! YUM I love white chicken chili and it’s been so long since I made some! Thanks for the great recipe and reminder! I need to give this a try. I have never found a white chili that I really like and hope that I can one day. Maybe this is the one. 🙂 Thanks for sharing. I struggle with finding something interesting to do with chicken. I always fall into the same rut with chicken since I serve it so often (I usually serve on the side with a veggie or sliced up in some pasta. This is going to be a great addition to our meal plan and just by the picture alone I can tell we’re going to love it! I’ve been wanting to try to make white chili I never have but I told my hubby I wanted to give it a try. I’ve seen a few different recipes. I think I have all the ingredients for this one except maybe the jalapeno. I So Love Chili Can’t Wait To Try New Recipe! My mom makes this. I am pinning this so I know have the recipe too! Pinning this. I have a current recipe but frankly it wasn’t that great. I think it was because it didn’t have the sour cream. I will try yours! This sounds absolutely delicious! I have never heard of white chicken chili. Our chili usually consists of beans and sausage and ground beef or I have one that is vegetarian. I think my family may like the change. I would love for you to stop by and share on my weekly recipe linky, Kids and a Mom in the Kitchen. We eat a lot of chicken, but I’ve never made chili with it, we will have to try this. This sounds really good. I’ve never made a chili before, this would be a good one to start with. Yum! 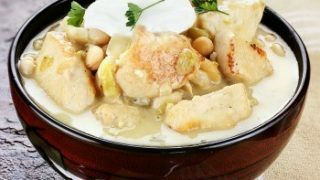 I Love chili, but still have not tried white chicken chili yet. I will have to try out your recipe. I love chicken but I always need new recipes to spice it up. Thanks for sharing. I’ve never tried making white chicken chili before, but I’ve liked it whenever I’ve had it. Maybe this will inspire me to give it a try! Just had a Thanksgiving thought: how would this do with turkey? Do you think it would be good? oooh! that’d would be a great use for turkey leftovers! You have no idea how long I have been looking for a great Chicken Chili recipe! Thanks for sharing.